On June 19, 2018 Kinetic’s President & CEO Tom Plumb and Mark Liudzius, Vice-President and Victoria Branch Manager handed over a cheque to HeroWork for $5,000.00 – funds that were raised at this year’s employee charity golf tournament. HeroWork is an organization that assists non-profits improve the state of their buildings through radical renovations and Mark sits on the organization’s Board of Directors. 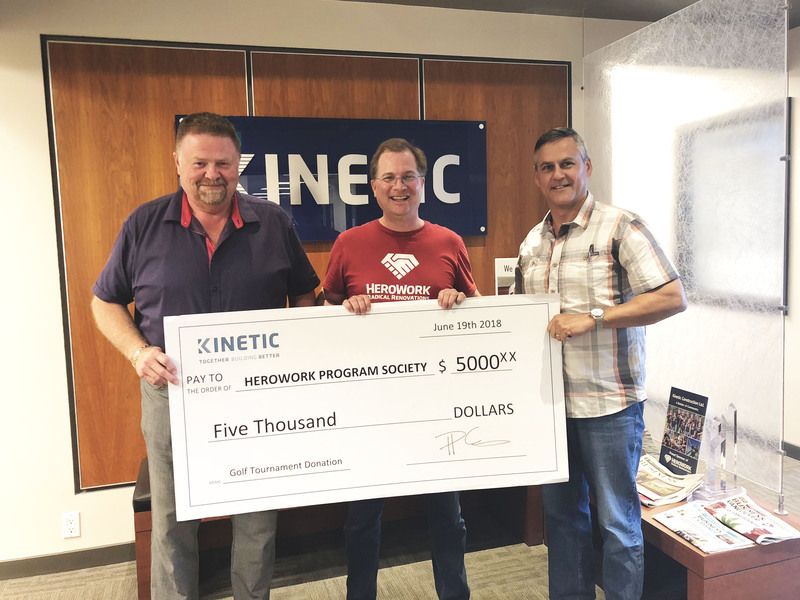 Kinetic is one of HeroWork’s Sustaining Sponsors and Major In-Kind Construction Contributors (2018). Last summer, a team from our Victoria office previously volunteered with the organization at a Hero BuildDay event – a unique team building event that leads volunteers through a construction experience to support the Society’s mission to assist different organizations.